I'm a little behind in the read-along, but it looks like everyone else is sort of at the same point I'm at, so I'm not too concerned. Life has been a bit chaotic and distractions aplenty (both books and other). 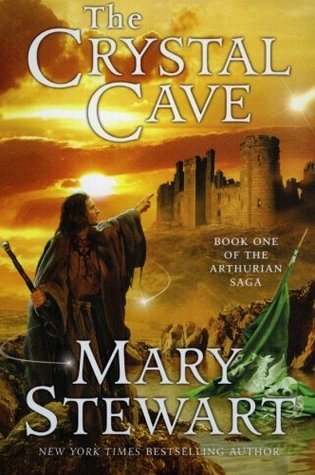 I'm hoping that with my weekend off coming up, I'll be able to get more of The Crystal Cave read, to a point where I don't feel guilty veering off onto another book for a couple days. I've decided to do a weekly update for this book, and each update will be broken down into each section of the book. Mainly because, so far, I've had little to say about it and haven't really come up with anything significant or productive to share. The Crystal Cave is well written and is proving an interesting, yet slow-paced adventure that is a little focused on set-up right now. I'm enjoying it, but it's still very easy for me to set it down and end up falling into a cozy mystery instead. To be honest, it took a little bit of time to get into this book because I might have gotten a little lost. But even so, I'm finding myself enjoying it, though I remain still slightly confused about all the events playing out. There are a lot of names and places and relationship connections that might have gotten a little muddled in my mind. And at times, I swear, I forget that Merlin is only a twelve year old boy at this time--he sounds, literally, wiser than his years, which I assume is deliberate. Of course, I suppose that with everything he's been going through, and how he's been treated while growing up, you kind of have to be a bit ahead of everyone else to survive. While the beginning of the book seemed to build up in a rather slow pace, by the time we reach the end of Book I, things seemed to have escalated very quickly. And now young Merlin is off on his official adventure, I assume. Up to this point, it all just feels like world-building, which I appreciate, but at the same time, doesn't bode well for my blogging since I don't really have anything productive to say about it. Okay, it took a little bit of thought to realize that twelve-year-old Merlin sounds wise beyond his years, because the story is sounding more like an account of Merlin's life by his older, and wiser self. I think there's a sentence that even intuits that older and wiser Merlin is penning what he remembers of his childhood. Except that, having noted that twelve-year-old Merlin sounds more mature than one would expect a child to sound, there are times where I have a hard time connecting the twelve-year-old child to the old wizard we all know as Merlin. I know it sounds like I'm contradicting myself, but I truly am seeing two different sides of this kid: on the one hand, he sounds older; on the other hand, he really DOES come off as just a kid. Anyway, the adventure starts now and I'm feeling really excited about it. It gives me impressions of some young children's fantasy adventure I might have read a long time ago. We've got a catalyst for Merlin to travel aimlessly, we've got sticky situations, and now we've got some significant scenarios to continue propelling young Merlin's journey to his fated destiny. I'm only four chapters into the second section, so the action so far still feels like world-building, but at least there are some potential significant events happening. Again, I'm finding I don't really have much of significance to say about what I've read so far, though hopefully I will by the time week two of the read-along is over. It's taking a while to get into this book, but I'm still really drawn to it.